1 Stud: Good evening, sir. 1 Ñ: It happens to be 3am. When do you sleep, 0x0A? 1 Stud: Never on the firm's time, sir. 2 Ñ: Sit down. Jamaica went off the air tonight, just like that. We've checked up, and Strangways has disappeared. 3 Stud: Was Strangways on something... special? 4 Ñ: Some new form of reggae beat, I think. 2013-01-02 Rerun commentary: The original M from the James Bond novels is explicitly a retired admiral, and the movie version played by Bernard Lee was based heavily on that, with a subtle nautical motif in his office. In Dr No we see several prints of old sailing ships on the wall behind M.
Neither Google Image Search nor TinEye can find any other version of this image anywhere on the web, so I'm afraid I can't tell you what it is. If you know, please drop me a line. EDIT: No hits yet, but several readers have written to say it's a clipper, and very possibly the Cutty Sark, of which many paintings were made. 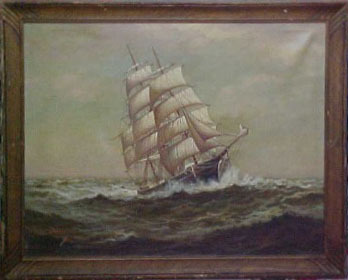 There are several images on the web which look similar to this painting - a clipper tilted at pretty much the same angle - but the details of the waves and sky are very different. It may be one of those scenes that many painters repaint. Last Modified: Wednesday, 2 January 2013; 22:28:20 PST.